We are in a period of unprecedented innovation and development across a wide range of sectors. Many of the new and impending technologies are so novel that it is unclear how existing regulation systems will manage them. AI, drones and autonomous vehicles are just some examples of technologies giving regulators pause for thought. All three examples raise difficult moral as well as practical questions; and given the rate of innovation, it now seems like too many questions are coming at once. The role of regulators is to ensure new technologies can be deployed in safe and meaningful ways. But this often slows the speed with which a new technology can come to market. Regulators have to balance safe deployment with not hindering the release of exciting new tech. A difficult task – and one about which the investors interviewed in the report are concerned. Who are Allied For Startups? Allied For Startups is a worldwide network of startup associations and advocacy organizations focused on improving the policy environment for startups. 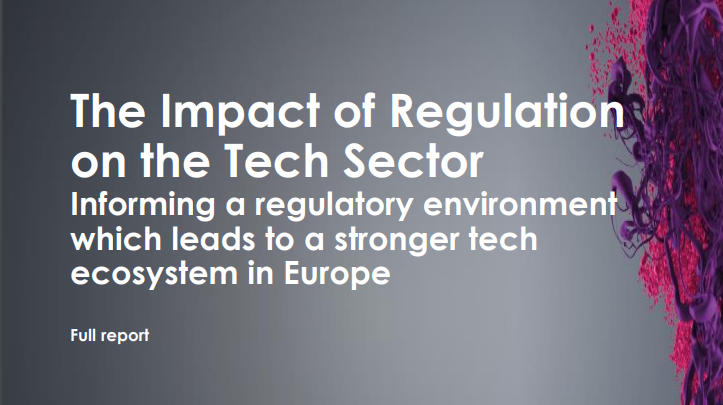 Their report on ‘The Impact of Regulation in the Tech Sector’ provides insight into the views of technology investors (among others) on reactive regulation and policy decisions that impact the development of the sector. Tech ecosystems take time to develop, but the benefits to the economy are substantial as new companies are spun out of existing ones, and the sector as a whole creates jobs and wealth. Based on 185 interviews, this report flags areas of opportunity and risk for the European tech ecosystem in the coming years. The report also highlights that tech investors are highly conscious and aware of the regulatory environment and that this can have a huge impact on their decision to invest or not. Furthermore, there are particular concerns among investors that regulation and taxes are designed to target larger companies but can have unintended consequences for startups, and that regulation is often reactive as opposed to strategic. Allied For Startups conclude their report by stating that a fairer and more stable regulatory environment is needed to ensure the tech sector continues to flourish. For more information on Allied for Startups please see here.